Benzema: Best in the world? The college football season is going strong and the NBA season is just starting, which means a lot of today and tomorrow’s sports debates are going to be variations of attempts to answer the same question: Who is No. 1? For college football fans, it’s about identifying the top team in the country, the next national champion. For NBA fans, it’s about identifying the best player in the league, a forever-unwinnable argument made even more heated by the mere presence of the phenomenal yet polarizing LeBron James. However passionate these arguments may be, they do not feature an extended cast of characters. At best, there are 10 to 15 college football teams out of the 100-plus teams in the NCAA’s top division worthy of being in the national-title conversation. And among the few hundred players in the 30-team NBA, only about five to seven can seriously be considered the best of the best. International soccer is, pardon the phrase, an entirely different ballgame. Premier soccer leagues exist in countries all over the world, with hundreds of quality teams, and the best players in the world are spread out accordingly. It’s one thing to debate LeBron vs. Kobe Bryant when one plays in Cleveland and the other is in Los Angeles and they play each other a couple of times each season. It’s another thing to debate Lionel Messi vs. Mario Balotelli when one plays in Spain and the other is in Italy and they might never play against each other. Still, everyone has their opinion about who is No. 1 when it comes to any sport, and it will always spark a spirited discussion. 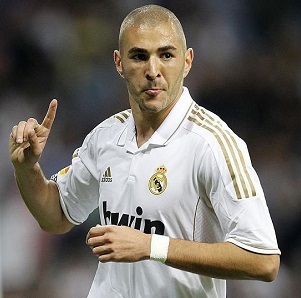 Karim Benzema is a 27-year-old Muslim soccer star who plays for Real Madrid (Spain) and the French national team. He has scored at least 20 and as many as 32 goals in each of the past five seasons while playing the striker position alongside superstar forwards Cristiano Ronaldo and Gareth Bale. Through his first eight matches this season, Benzema has seven goals. That productivity is surely part of what led former Real Madrid manager Carlo Ancelotti to raise eyebrows around the world when he recently claimed Benzema is the best striker in the world in an interview with the UK’s Mirror. Benzema’s resume certainly backs up his former manager’s opinion. Benzema has been on five championship teams in some of the top leagues in the world. He has also won UEFA Champions League, Copa Del Rey and FIFA Club World Cup titles. He is a three-time French Player of the Year and former Ligue 1 (France) Player of the Year. In the 2014 World Cup, he helped France advance to the quarterfinals, scoring a team-high three goals and getting three assists (tied for third among all players) during the tournament.